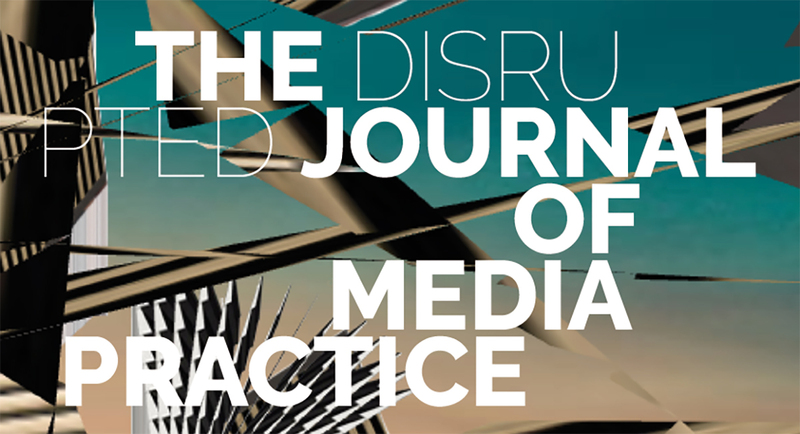 The Journal of Media Practice (JMP) has, over the years, through its focus on media practice as research, formed an invaluable platform for the communication and circulation of practice-based media-arts research. Through collaborations with its online digital companion, the ScreenWorks platform for peer-reviewed practice research in film and screen media, JMP has been a forerunner in championing and adopting the various multimodal forms practice-based and creative works can take within the context of an academic publication. However, although media practice as a field and community embraces a plurality of media, the materiality of its scholarly forms of production and communication remain predominantly text-based. How then, should a journal of media practice extend from a speculative focus on what media practice as research could be, to an exploration of the alternative forms of communication and circulation it could enable? With this hybrid (online and print) open access issue, we want to explore the potential disruptive nature of media practice publishing, as a positive force beyond the safe and pleasant ground of the print-on-paper article; but disrupting our forms of communications will have wider consequences, not least in considering the future of university teaching, learning, research and publication in a context of digital media and disruptive technologies. At the same time, any future for practice-based research will include how it is considered and evaluated in the light of metric driven research evaluation frameworks such as the UK’s Research Excellence Framework (REF). In principle the REF is agnostic where it concerns the form of a research output, however, universities tend to tailor their submissions to the kind of research they think the expert panels can readily quantify, where the REF panels tend to mainly reflect disciplinary hierarchies—causing concerns about their makeup and lack of diversity, where they have failed to reward innovation (Neyland and Milyaeva 2017). This, in combination with a growing audit culture in the UK—connected to the importance of being ‘REF-able’—is cultivating a conservative environment that tends to discourage the publication of creative and practice-based academic works, where for the latter the research output—often non-standard—tends to be an integral element of the research. Similarly, the REF seems to have difficulty recognising the great deal of work that goes into the creation and development of research communities. For example research outputs in the form of single authored articles are readily accepted, but the more fluid and collaborative work of editing and community building is ineligible, discouraging scholars from taking up these important contributions to research and missed opportunities to realise future pathways to impact. This special issue seeks to counter this development by envisioning the journal (artefact) itself as a output of creative conception and production, which showcases the various forms practice-based research can (potentially) take, whilst at the same time emphasising that this research can be of equal quality (as well as being just as rigorously reviewed) as more traditional text-based articles. This issue has been structured around a series of curated conversations to emphasise the evolving and collaborative nature of the research. The articles around which these conversations have centered have openly evolved (from ‘drafts’ to ‘final versions’ and beyond) on our custom-designed platform as well as on participants’ own websites and servers or on external multimedia platforms, in those instances where this suited their projects better. Our platform has been designed by one of our editors, Alex Masters, and built based on the requirements of our participating researchers, enabling a wide range of options for multimodal and processual content. As such the submissions around which our conversations were centered are multimodal, text-based and/or hybrid; articles, blog posts or podcasts; both processual and collaborative. The various on and off-platform submissions where brought together on the platform, both through the short project descriptions, abstracts and keywords provided by the participants, as well as by the conversations. These conversations, which centred around various papers-in-progress, incorporated peer commentary and reviews from our participants, from their communities, as well as from invited international media artists, practitioners and theorists, and, of course, from the online audience at large. These conversations were enabled and structured with the help of the hypothes.is plugin, an open annotation tool for the web, which we installed on our platform. Using custom-designed tags (i.e. #disruptedjournal) we were able to set up a live-feed of the comments as they developed around the content both on and off platform, providing a live-feed and timeline of the conversations on the platform, and enabling audiences to follow them either on their own, or entangled with adjacent conversations. Another editor, Jurij Smrke, custom-designed the hypothes.is feed to aid the flow of the conversation, in such a way that all comments came in chronologically (last first) instead of as nested replies to earlier comments. The conversational experiment with hypothes.is proved very informative, where there was initially some resistance from some of our contributors—it remains challenging for academics to familiarise themselves and start using a new piece of software—where on the other hand other participants were already familiar with hypothes.is and/or were tied in to a community of users; hence some of the submissions developed a larger online conversation around their content, and faster, than some of the others did. It also proved difficult for people not already connected to an online community to source comments from colleagues and/or collaborators. In this sense our experience was that hypothes.is, was a useful tool to further enable access to and develop conversations around the content; naturally there were greater levels of engagement across a community of practice that was already familiar with this software and that already invests in collaborative forms of research. At the same time and importantly, the more tentative efforts of the less “connected” participants did prove most assuredly to be the more disruptive and transformational. Debating Media Practice Publishing. What could a journal of media practice be in a digital environment? What can we learn from best practices? Performative Publishing. How do the media we use perform their content and vice versa? How we can bring together and align more closely the material form of a publication with its content? What is the agency of our media, and how are we entangled with the media we use? Practice-Based Methodologies. What methods are most suited to creative practice as research? How can we more closely align practice as research through methodology? How can we explore criticality with or via different media forms? The conversations took place on additional levels beyond the hypothes.is commentaries and live-feed; we also commissioned our editors to write a series of blogposts, which were made available on the platform, reflecting on both the articles-in-progress and on various topics of the conversations. These blogposts in many ways form an alternative foregrounding to this special issue, a collaborative introduction written by both editors and contributors, reflecting on the ideas behind this special issue, on the themes structuring our conversations, and on the processes and practices involved in making this special issue happen. Our conversations were also accompanied by two Meta-Projects, which were not set up by their contributors to function as full submissions to the journal, but rather in various ways scaffolded onto the platform, onto the research projects, and onto the conversations, creating work which both entangled with (the contributions on) the platform and separated from it/them. The project ‘Change in Breath’ by the artist collective Doors Unlimited functioned as a ‘dramatic para-enactment of other contributors’ projects-in-progress restaged as an offline conversation among researchers anticipating imminent and irrevocable transfiguration’. As such Doors Unlimited used some of the material-in-progress on our platform as part of a symposium they hosted in Canada—from the 15th until the 17th of July 2016, see http://deathbedssymposium.blogspot.ca.—adopting parts of its discourse and reconfiguring this in an offline setting, enabling a dialogue (i.e. functioning as transducer) between the online conversations on the platform and the offline conversations held during the symposium. Their results remained confined to the symposium, where they choose to problematise the idea of publishing by not producing any content for the internet, but keeping it contained within the event of their symposium. Jurij Smrke’s meta-project ‘Philosophers Have Only Referred to Texts, the Point is to Link Them’ explored the potential of automated direct linking from references to the location of these references. Smrke’s aim was to help the contributors to this special issue link from their texts’ references directly to the passages they quote, within the limits of online availability of the originals. Not only is Smrke’s contribution an exploration of the question why this is not yet common practice from a technical perspective, he also aimed to explore the ethical and moral questions of linking to online available content, especially to what he calls the ‘deprivatised content’ available in shadow libraries. One of the positive outcomes of the conversations and this special issue is that it has opened up a new and international audience for potential future contributors for JMP, where this special issue includes contributors from the US, Canada, Australia, the UK, and Denmark, and includes commentaries from many others internationally who joined in in the online conversations. After the informal and communal feedback and review mechanism that the conversations via the hypothes.is plugin provided to the in-progress content on the platform, we arranged a formal open peer review process for those submissions of which their authors felt they were ready to be published (some of the contributors on the platform opted out of this part of the process, for example because they felt their content needed further development). Each of those articles/submissions on the platform were assigned 2 or more reviewers, who, in consultation with the reviewees, decided to either conduct a closed, semi-closed or open form of peer review. Unanimously, the reviewers and reviewees opted for an open form of review, but in practice many also had various offline conversations via email or other forms of communication. One of the reviews, for the contribution submitted by the Cinematologists (Neil Fox and Dario Llinares), which was in the form of a podcast, was similarly recorded as a podcast review (which is available here) and was subsequently mixed into the Cinematologists’ final submission for this special issue. The open peer review process was again conducted with the aid of hypothes.is and typically took place over a period of 1 to 2 months. After this period the reviewers were asked to additionally complete a formal peer-review feedback form as is commonly used by JMP, both to summarise their online comments for the editors and reviewees, and to give the reviewers the opportunity to perhaps state opinions which they may not have felt appropriate to voice in an open online environment. Submissions that were accepted after this formal open peer review process would be included in both the print version and the accompanying online version of JMP available on the Taylor & Francis (T&F) website. Next to the version of this special issue that is available on the platform, and which includes various submissions, from peer-reviewed to non-peer reviewed, from completed to in-progress and meta-projects, which can all still be updated, changed, extended, enhanced and commented upon, we also led the creative direction for a fixed version of record, both in print and in a hyperlinked PDF, available on the T&F website. The custom-designed online PDF version available on our website is available in open access, which, since the contributions created as part of this special issue were developed in an open and experimental way, based on an ethics of sharing, openness and collaboration, we deemed essential for the further continuation of these conversations in a more formal published journal context. Furthermore, as Zach McDowell, one of the contributors to this special issue has also argued, we as editors would argue that any future journal of media practice should be available in open access, to ensure that practice-based research be as widely available and discoverable as possible. Where the ‘platform’ version of this special issue had relatively few boundaries concerning length, form and development of the submissions, the ‘print’ version forced us to rethink what a Journal of Media Practice might be, given the constraints of the print medium (as well as the publisher’s guidelines). The publisher supported our decision for the need to custom-design the print edition. Designed in collaboration with Mark Murphy of Surely Design and our authors, we have attempted to creatively respond to the specific affordances of their projects. In this sense, each contributor was asked to think about how they would like to see their contributions translated in a print environment, whilst at the same time wanting to stretch the specific print practices that we have come to use for an academic journal. After a few months of extremely open and experimental discussion, as editors it was interesting to observe how easily and readily we academics seem to revert to more traditional forms of writing, thus highlighting deeply ingrained habits, which at least through this project, we were able to make visible and itself open to discussion. The final design uses open source fonts and employs three experimental layouts across the journal, from the relatively tame linear article through to the more adventurous inter-woven non-hierarchical non-linear manifestation, or the decisive Quick Response (QR code) online only representation. For us this special issue encompasses all these online and offline versions and with this focus on the processual nature of research we wanted to challenge the focus on the publication as a fixed and finalized object and commodity, which, especially in the context of practice-based research, does not necessarily reflect the research process. With this experiment in editing, curating, designing and community-building, we aimed to create an environment which supported and stimulated the various forms in which media practice can be published, whilst developing both the platform, the content and projects, and the various versions of this special issue together in a collaborative and creative environment. Craig Batty, Leo Berkeley and Smiljana Glisovic in their feature, A morning coffee in Melbourne, engage as three practitioner-researchers in a lively conversation highlighting the contentious spaces of media practice research. It employs a more playful approach to the production of scholarly endeavour and is reversioned to sit in parallel with the annotated collective online critique and sets the tone for our special edition. Remi Kalir and Jeremy Dean’s Web Annotation as Conversation and Interruption showcases the features of web annotation as media practice, recounting the orchestration of a series of thematic exchanges about media practice, openness and politics. The thematic conversations inspired an ensemble of public contributors, creating a laminated and multi-authored document, followed by a reflection on the experience and the generated content. It is the authors’ hope that this experiment can model and theorise new and disruptive media practices for research design, peer review, and publishing. As part of his contribution UniverCity: Images of Success and Structures of Risk, which constitutes a manifold of textual, image- and forum-based forms, Adam Brown contemplates how his own academic labour as part of this research contributes to the production of academic capital and is eventually deployed to produce physical architectural space. Through a critical engagement with CGI rendered images of university buildings, Brown explores how these set out specific ideological positions designed to control the indeterminable space of the university. Yet Brown also finds hope in disrupting these images to imagine and dream up alternatives to perform the university’s productive conflict. In “Knowing Sounds” Neil Fox and Dario Llinares explore the possibilities of using the podcast medium for academic research. They play with aural engagement, explore how sound production and dissemination in the digital age can challenge logocentrism and interrogate both the ubiquity and limitations of the podcast medium. Furthermore, they engage with other contributors to the Journal, discussing how alternative methods can unsettle assumptions about the relationship between practice and theory. Zachary J. McDowell, in his contribution Disrupting Academic Publishing: Questions of Access in a Digital Environment, explores how we as scholars have been performing our labour through a specific (print-based) journal distribution system. By tracing the disruptive influence digital technology has had on this system, on our access to it and on our labour relations, McDowell considers how the digital might disrupt publishing in a more radical way and aid in the creation of a more just publishing system, when we adopt truly open practices. Janneke Adema’s Performative Publications contribution is a reflection on the praxis, ethics and politics of academic publishing. Offered as a performative publication it embodies the inherently processual and experimental aims for this special edition. Adema presents the reader with a multi-faceted experience, a cleverly layered montage from the original versions; website; the posters; and the orchestrated annotated online exchanges. In Creative Practice as Research Lyle Skains discusses how artistic practice has developed into a major focus of research, be it as process, product or discourse in various disciplines, making a strong case for its validity as a method. Presenting a methodological approach to creative practice as research, this paper includes an overview of practice-related research approaches across a variety of disciplines, and is itself built through a living discussion of practice-based methodologies, inviting ongoing reader contributions. In Remembering, Reflecting, Returning, Katherine Wimpenny, Peter Gouzouasis and Karen Benthall bring together poetry, music, images and personal narratives to demonstrate collaborative research practices and illuminate their experiences as practitioner-artists/researchers/teachers. This autoethnographic bricolage explores possibilities to re-examine and share alternative avenues of scholarship and theoretical understanding, and to engage the reader-viewer-listener in (re)thinking what contribution to knowledge artistic processes can make methodologically, pedagogically, aesthetically, and therapeutically. Adema, Janneke, and Gary Hall. 2016. “Posthumanities: The Dark Side of ‘The Dark Side of the Digital.’” Journal of Electronic Publishing 19 (2). Broekman, Pauline van Mourik, Gary Hall, Ted Byfield, Shaun Hides, and Simon Worthington. 2014. Open Education: A Study in Disruption. London; New York: Rowman & Littlefield International. Hall, Gary. 2016. The Uberfication of the University. Univ Of Minnesota Press. Neyland, Daniel, and Sveta Milyaeva. 2017. “The Challenges of Research Assessment: A Qualitative Analysis of REF2014.” The European Research Council. Goldsmiths, University of London. There have been further precedents in the field of media studies, where several journals are currently experimenting with multimodal work, from CTRL-Z and NECSUS, to Sensate and Thresholds—taking their inspiration from more broadly focused pioneers such as Vectors, Kairos and Inflexions.